If you’re at all connected to the film industry, then you already know that Atlanta has become one of the filmmaking capitals of the U.S. Thanks to local laws and economic incentives friendly to the film and TV industries, marquee franchises such as Guardians of the Galaxy or The Walking Dead are all being shot in and around the ATL. The thing is, Atlanta is usually standing in for somewhere else. Rarely do the films shot in Atlanta actually take place in Atlanta, or heavily reference Atlanta locales by name. That’s what makes Edgar Wright’s Baby Driver such an unusual and refreshing change of pace. It’s almost shocking just how many overt Atlanta references are crammed into this insanely entertaining, whiz-bang action flick. I must admit that I don’t actually know Atlanta as well as many of my peers at Paste who are natives of the area. I’m originally from the suburbs of Chicago, and have lived in Atlanta since the fall of 2014. But watching Baby Driver, I couldn’t help but feel a certain sense of pride for my adoptive home. Outside of Donald Glover’s titular Atlanta on TV, rarely has the city received such a cool spotlight during my time here. In discussing the film’s Atlanta connections with others at Paste, I was reminded of something: A deeper level connection with each film’s city does seem to be a hallmark of Edgar Wright’s filmography. Look at Scott Pilgrim vs. the World, for instance, which is at least partially defined by its Toronto setting: As in the comic the film is based upon, the characters wear their Canadian home on their sleeves. 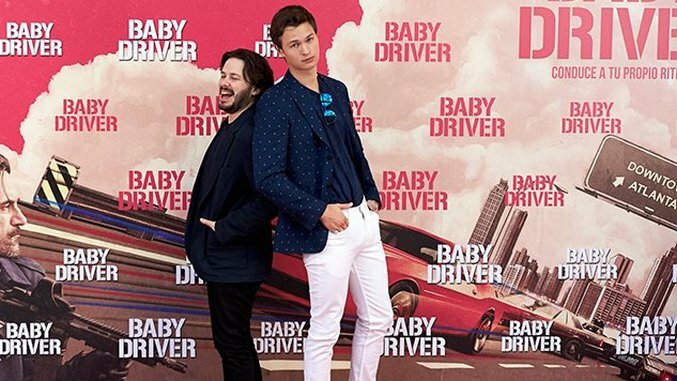 So it goes with Wright’s latest film, which revolves around a young getaway driver named Baby (Ansel Elgort) who works for a cadre of criminals, driving them to safety from bank heists. Looking into it more deeply online, I found this deeper level of connection was indeed the case with Baby Driver. As he told in an interview with Vice, Wright rewrote the movie from taking place in L.A. to taking place in ATL when he learned where he would be shooting. Once I knew we were going to be in Atlanta, I rewrote the script to be Atlanta instead of Los Angeles. I wanted to use all the parts of Atlanta because usually Atlanta on the screen is appearing as other cities. Most films are using it as New York or LA or San Francisco or South Africa. So actually using Atlanta for Atlanta was great, and we wanted to make use of the downtown Atlanta section with the oldest buildings and the ramps to the freeway. You don’t really see the typical leafy Georgia until the end of the movie. A lot of the things that are in the movie are like sort of Atlanta-specific like Octane Coffee, Criminal Records—a famous record store there—also like obviously the ATL Twins are in there, but we have the local Atlanta FOX 5 in there, and then lots of Atlanta radio stations are heard. So when you hear radio voices in the movie, they’re all Atlanta local DJs. Even the names of the restaurants, like Bacchanalia, is a real Atlanta restaurant, and the pizza place that he works at called Goodfella’s Pizza & Wings is a real Atlanta place. So it’s not that we art directed that, that’s actually what it looks like. So in quite a lot of the places, it was a very freeing thing; it’s like we’re just going to use this exactly as it is. Below, I’ve listed the specific Atlanta places and landmarks featured prominently in the film, and their contexts. I’m sure that I’ve missed plenty, but these were simply the most prominent ones that I recognized. Be warned: There are going to be Baby Driver spoilers in here, as I can’t exactly discuss them while keeping the piece entirely spoiler-free. Octane is a hip, industrial modern-styled local chain of four large, full service cafes in the Atlanta area, although the “local” is somewhat questionable after the company announced it was being acquired by Birmingham, AL-based Revelator Coffee this Spring. Still, each Octane space has an effortlessly cool vibe—I’m partial to the Grant Park location, which has played host to Atlanta’s monthly PechaKucha presentation in the past. I don’t know how these guys got such a prime, starring role in the film, but the Octane logo could hardly be more visible throughout, and their coffee is legitimately a major plot point: Baby is constantly instructed by the various members of his heists to go grab their coffees from Octane locations. Did the chain simply provide free coffee for all the shoots? If so, they most definitely got their money’s worth with the massive product placement here. One of Atlanta’s most critically acclaimed (and priciest) date night restaurants since 1993, chef Anne Quatrano and Clifford Harrison’s Bacchanalia is something of a status symbol of ATL fine dining. It’s the kind of place where you can get an appetizer that is a plate of flavored foams spread across an unidentifiable emulsion, but who are you really kidding: You’re probably going to order a prime NY strip, and the staff knows it. Bacchanalia is referenced by name by Jon Hamm’s character when discussing how he’s going to treat his girlfriend, which is then later parroted by Baby when he takes his waitress girlfriend, Deborah (Lily James), there for a night on the town after trying to leave his life of crime. Naturally, Kevin Spacey’s ringleader, Doc, shows up to buy them mushroom tartine and rope him back into some decidedly illegal activity. Atlanta’s Tom Moreland Interchange, where I-85 and I-285 meet, is colloquially known as “Spaghetti Junction” thanks to its tangle of roads. It’s a name immortalized by Outkast with a track by the same name in their 2000 album Stankonia, and it’s also apparently part of the legend of Baby’s driving prowess. Several times in the film, we hear rumor of an incident called the “Spirit of 85,” which apparently happened 10 years earlier on the same interstate when a young Baby led police officers on a car chase through Spaghetti Junction, ultimately evading capture. It begs the question: Did they cleverly work in a pasta-named road in reference to “The Noodle Incident” (an unexplained, oft-referenced story) of Calvin & Hobbes fame? Or is it a happy coincidence? For you national readers, you’ve probably seen I-85 in the news in 2017: It was a stretch of this interstate that collapsed in a fiery heap back in May. There’s a sequence in the film in which Doc lays out a heist to his gang of thieves, and when Baby is tasked to repeat it back verbatim, it’s absolutely rife with Atlanta references. The route doesn’t make much sense, considering that it references places like the Perimeter Mall in Dunwoody at one moment and Hartsfield Jackson Airport in another, but for an ATL resident it’s still a strange experience to hear so many local landmarks rattled off by Kevin Spacey and Ansel Elgort. This underground mall in the Five Points area of downtown Atlanta has the honor of being both an ATL landmark and an ugly relic of the 1970s all in one. Once a popular hangout and retail destination, the space has since devolved into a bizarre, carnival-like pastiche of fake jewelry shops and cell phone vendors, each more tacky than the last. Baby Driver captures this sense of depressing banality when Baby is chased on foot by police through Underground Atlanta, occasionally ducking into shops in an attempt to pick up disguises but mostly recoiling in disgust from overpriced trinkets that only the most foolhardy tourist could be persuaded into buying. EDIT: Turns out that my relative lack of Atlanta geographical knowhow bit me on this one, as the site in question is actually Peachtree Center rather than Underground Atlanta, a few blocks further north. In fact, before ducking into Underground Atlanta, Baby evades police at nearby Georgia State, with campus buildings and parking decks clearly visible in the backgrounds of various scenes. Even the film’s car chases are like a visual puzzle for Atlanta residents, as several take place on major downtown ATL thoroughfares. My favorite site was what is clearly the corner of Peachtree St. NW and Andrew Young International Blvd. in downtown Atlanta—pretty hard to miss a street corner that features both a Hard Rock Cafe and a Hooters in plain site, even if a car chase is happening at the time. There’s a whole lot of Atlanta in Baby Driver, but there’s nothing more ATL in this film than the fact that the waitress of a diner simply assumes that the four people who have sat down at her booth all want Cokes. Not Diet Cokes, or Coke Zeros. CERTAINLY not Pepsis. Just Cokes. If you’re not familiar, the Coca-Cola company is headquartered in Atlanta, as is the tourist trap “World of Coca-Cola” museum, and the city manifests what is most assuredly an unhealthy devotion to Coke as a brand. It’s like nothing I’ve ever seen elsewhere in 30 years—every single person in this area was raised drinking no other cola. The mere suggestion of any cola that isn’t Coke is immediately scoffed at. Not only scoffed at, but dismissed as the ravings of a lunatic. I’ve never seen such strong branding and consumer loyalty to any product in any other city—they make the fondness of St. Louisians for Budweiser look like a passing fancy. So yes, the Coke assumption is quite real. Jim Vorel is a Paste Magazine staff writer and avowed Edgar Wright fan. You can follow him on Twitter.